THIS great festival takes its name from the happy tidings brought by the angel Gabriel to the Blessed Virgin, concerning the Incarnation of the Son of God. It commemorates the most important embassy that was ever known: an embassy sent by the King of kings, performed by one of the chief princes of His heavenly court; directed, not to the great ones of this earth, but to a poor, unknown virgin, who, being endowed with the most angelic purity of soul and body, being withal perfectly humble and devoted to God, was greater in His eyes than the mightiest monarch in the world. When the Son of God became man, He could have taken upon Him our nature without the cooperation of any creature; but He was pleased to be born of a woman. In the choice of her whom He raised to this most sublime of all dignities, He pitched upon the one who, by the riches of His grace and virtues, was of all others the most holy and the most perfect. The design of this embassy of the archangel is to give a Saviour to the world, a victim of propitiation to the sinner, a model to the just, a son to this Virgin, remaining still a virgin, and a new nature to the Son of God, the nature of man, capable of suffering pain and anguish in order to satisfy God’s justice for our transgressions. 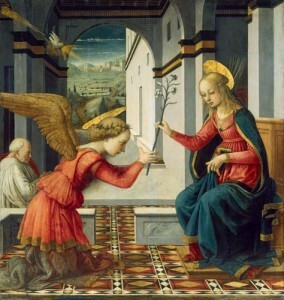 When the angel appeared to Mary and addressed her, the Blessed Virgin was troubled: not at the angel’s appearance, says St. Ambrose, for heavenly visions and a commerce with the blessed spirits had been familiar to her; but what alarmed her, he says, was the angel’s appearing in human form, in the shape of a young man. What might add to her fright on the occasion was his addressing her in words of praise. Mary, guarded by her modesty, is in confusion at expressions of this sort, and dreads the least appearance of deluding flattery. Such high commendations make her cautious how she answers, till in silence she has more fully considered of the matter: “She revolved in her mind,” says St. Luke, “what manner of salutation this should be.” Ah, what numbers of innocent souls have been corrupted for want of using the like precautions! 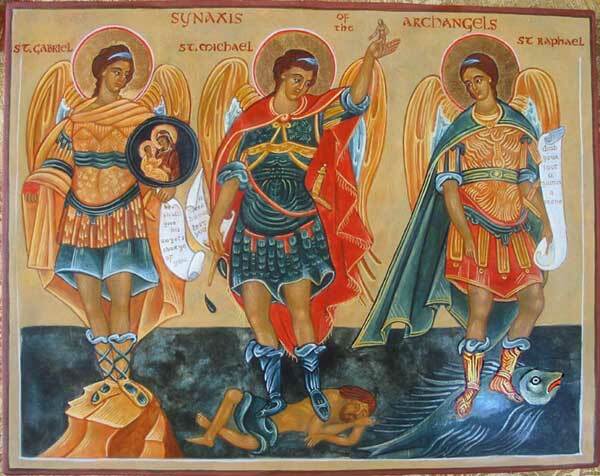 The angel, to calm her, says: “Fear not, Mary, for thou hast found favor before God.” He then informs her that she is to conceive and bring forth a Son Whose name shall be Jesus, Who shall be great, and the Son of the Most High, and possessed of the throne of David, her illustrious ancestor. Mary, out of a just concern to know how she may comply with the will of God without prejudice to her vow of virginity, inquires, “How shall this be?” Nor does she give her consent till the heavenly messenger acquaints her that it is to be a work of the Holy Ghost, who, in making her fruitful, will not intrench in the least upon her virginal purity. In submission, therefore, to God’s will, without any further inquiries, she expresses her assent in these humble but powerful words: “Behold the handmaid of the Lord; be it done to me according to Thy word” What faith and confidence does her answer express! what profound humility and perfect obedience! Reflection.—From the example of the Blessed Virgin in this mystery, how ardent a love ought we to conceive of purity and humility! The Holy Ghost is invited by purity to dwell in souls, but is chased away by the filth of the contrary vice. Humility is the foundation of a spiritual life. By it Mary was prepared for the extraordinary graces and all virtues with which she was enriched, and for the eminent dignity of Mother of God.